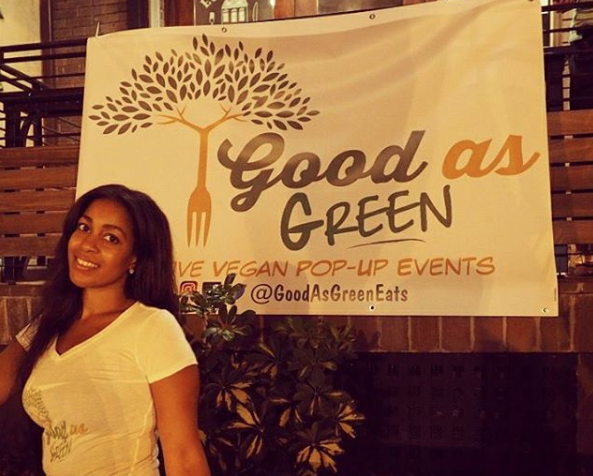 Business Name & Description: Good As Green, LLC is a creative vegan food company that provides beneficial superfoods and fresh produce transformed into exotic, gourmet meals. We have provided food for nonprofit organizations and shipped some of our menu items directly to loyal customers, and we host fun brunch and dinner pop-up events. What year did you found your company? 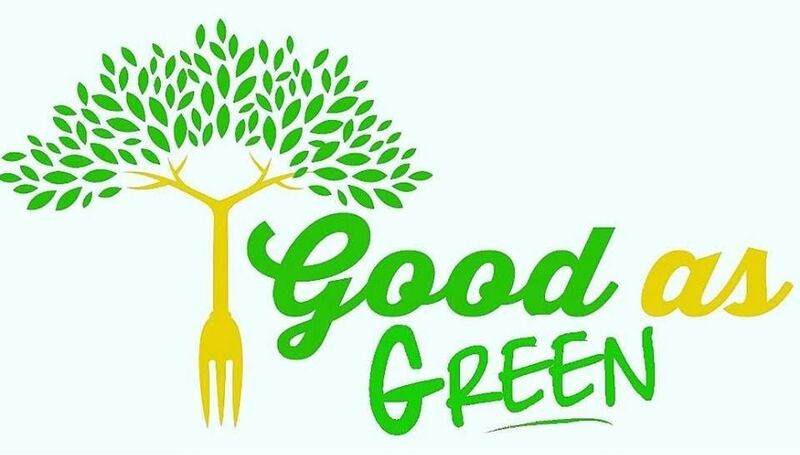 Good As Green, LLC was officially established this year (2016), but I have been providing meals for my clients as a personal trainer since 2014. That’s actually how my company began. What has been the most exciting and/or fearful moment during your HBCUpreneur career? I have had a company in the past, that I provided media services such as video editing and marketing presentations. That was when I graduated college, as I graduated from the John H. Johnson School of Communications (Old Howard) with a degree in Communication. When I was experiencing an arduous time finding opportunities, I just created my own and freelanced for a while. It was very exciting when I first began and I was doing what I really enjoyed, but it was DIFFICULT and REALLY ROUGH! I had to move back home, save money, work multiple gigs, and work was inconsistent. Although, this time around, I’m much more fulfilled. I’m happy for the inconsistencies and still involved with media, but now as a health and fitness consultant. I was SO afraid to launch Good As Green, especially because of what happened with my first company, but I have such a wonderful support system and so many people encouraged me to take the leap. I was afraid since I didn’t attend culinary school, but people OTHER than my family enjoyed my food and I’ve helped so many people adopt plant-based lifestyles, so the fear subsided. When I launched a pop-up in DC back in September, everything that could go wrong tried to, but it ended up being a successful first event. I was nervous before, during, and after the event! I knew I made the right decision when so many people attended the pop-up, including one of my non-vegan friends all the way from New Jersey, and genuinely enjoyed the food (we are brutally honest up North LOL). 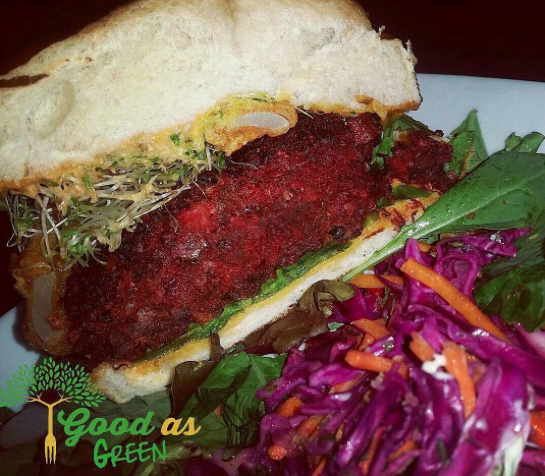 People who don’t even like beets enjoyed my Smoky Beets burgers, so I received many requests to deliver and ship them. One of the most rewarding moments was when I provided breakfast for Run Hope Work, a non-profit organization that provides mentorship and trade certification for Washington, D.C. youth. They were highly apprehensive and skeptical at first, but they really enjoyed the food I provided! I made Sweet Potato French Toast, Smoky Beet Sausage, Good As Home Fries (we use green bananas instead of potatoes), Apple Pie Oatmeal, Loaded Breakfast Burritos, Smoky Arugula Avocado Toast, Alkaline water, and Homemade Hemp Protein Shakes (that they described as vanilla milkshakes). That week that I provided breakfast was confirmation for me because these guys were eating McDonald’s and carryout. Many said they hadn’t eaten “green stuff” before and they really didn’t know if vegan food would taste good. It made me feel good and is my mission. I provide creative whole foods, not just tofu or seitan. I also list the benefits of most of the ingredients I use. What made you want to start your own company? I really enjoy helping people! The first time, I was forced into creating my own opportunity, but this time around, it’s much more rewarding. As a personal trainer, the most important component that I found my clients struggling with the most was food. Some clients told me straight up, “I’m too lazy to cook.” I didn’t want to waste my time or my clients’ money by allowing them to sabotage themselves, so I did their meal prep for them and all they had to do was add their own meat if interested. So many of my clients never added the meat and were completely satisfied. I then began providing meals for people simply curious about vegan food. I wanted to replicate the feeling I had when people told me that I assisted them in living healthier and so Good As Green began! Who was the most influential person/people for you during your time in college? It’s really interesting when you attend an HBCU. Most of the time, you really just have to figure things out on your own or make due with what you have. It really prepped me for where I am today. I’ve always been a go-getter, but I’m a lot more resourceful because college helped me learn that. How do you handle complex problems? I believe meditation is important. It keeps you calm, centered, and assured that there is a solution that you must work to find. I’ve always been good at figuring things out. My mother and grandmother taught me how to research what I didn’t know and try, even if I don’t know exactly how it pan out. Being tuned into the universe helps you KNOW it will all work out. What is something you wish you had known prior to starting your company? I wish I had known a LOT of things, but I don’t want to focus on those things because I have since figured out ways to correct them and I don’t feel like getting the side eye from fellow business owners, LOL. Data from Innova Market Insights has shown a 60 percent rise in the number of global food and beverage launches using a vegetarian claim between 2011 and 2015 and vegan google searched have climbed over 30 percent from 2014 to 2015. The vegan lifestyle though has always been around for a long time even if it did not have a name, but what do you believe has caused its recent surge among the American population in the past decade into more mainstream? The funny thing is back in 2011, I predicted this would happen. With the rise in disease diagnoses, people are looking for alternative methods to conventional medicine. People want to live longer and better. Many people do not see the direct link between food and disease. I believe that people became more health conscious when the GMO bill was passed. The United States of America is the most meat-centric country. I believe people were beginning to notice the effects of that. People now see the spike in obesity, heart disease, and cancer and they want to change that. In 2013, when I began a project focused on vegetarianism, people couldn’t see my vision because it wasn’t yet normalized the way it is now. I am happy to see the acceptance of the lifestyle and now we have more and better options (instead of suggesting a simple salad). Your business model is certainly unique where you are essentially combining a restaurant, event planning, and clubesque all in one. What was the inspiration and euphoric moment that made you decide on this business model? I know what I like when I go out. I hate that I have to eat first before an event because there probably aren’t going to be any vegan option. I hate that I have to eat AFTER an event, if anything is even open, because there aren’t many options. Most of the restaurants that offer vegan cuisine are fast-food. People assume that vegans are just one way: we all wear clothes from Whole Foods and preach about veganism all day. That’s definitely not me or the vegan friends in my circle! I enjoy experiences. I enjoy vibing with others and meeting new people. I decided to offer fun events with healthy, delicious food and beneficial beverages. As Howard Alum, everything is an event! I wanted to creative a dope atmosphere with dope people, good music, and food that just happened to be vegan. Since that was done successfully in September and now that I’m getting inquiries for other cities, I know this is a demand. Products are always a way to leverage and grow a company’s visibility and revenue. Do you see Good As Green eventually moving in that direction or will you keep the focus on the core business at hand? At this time, I’m not particularly sure about that, but I am receiving a lot of orders for my Smoky Beet Burgers. This area is still new to me and there are lots of challenges, but it seems to keep Good As Green profitable in-between pop-up events. I’m still perfecting this, but people really seem to love it. My main focus, though, is on my pop-up and other events. HBCU agriculture or HBCU 1890 schools that operate farms seem like a natural fit for your company. In what ways do you think you could find collaborative ground with them? I hadn’t thought of it until this question. I love bartering and collaborative efforts, especially with HBCUs. I will definitely look into it and gladly accept advice about it! What do you believe HBCUs can do to spur more innovation and entrepreneurship while their students are in school either as undergraduate or graduate students? I am not particularly sure about other HBCUs, and I’m sure they do also, but Howard highly encourages entrepreneurship. Most of our courses required independent projects. As a Broadcast Journalism major, I had to learn ALL the aspects of broadcast production, not just on-air work. I learned about radio production, video production and editing, script writing, and the running of a newsroom. This especially came in handy when I ran my own projects. I would be out on assignment, lugging a camera, microphone, and other equipment, while students from other schools had a crew/team. It definitely came in handy after school! Honestly though, I wish the institution was more supportive of the alumni. How do you deal with rejection? I reject rejection. I don’t believe in the word “No” when it comes to something I’m passionate about. It’s just not a good fit for you in this particular situation at this particular time. That’s all it means to me. When you have down time how do you like to spend it? When I have down time, I love going on food adventures because I’m greedy and I don’t consider it “down time,” because I schedule it into my day, but I really enjoy working out. I wish I could travel more. I’m working hard at spending more time with family and friends. That seems very rare when you are running your own business! What was your most memorable HBCU memory? I really wish that I lived more in my moments at Howard! I had such great times with great people! I loved hanging out in the Caf’, Bisonette practice, and hanging out on the yard. Of course I loved when Homecoming came around. I believe the most memorable moment at Howard was meeting Debbie Allen and standing next to her. She was actually my inspiration for choosing Howard! At the time, I was in many dance and performing arts programs, so I believed I was going to walk in her shadow. I also admired her direction for A Different World, so when she was standing next to me, I secretly lost it! She was sweeter than I imagined and I was grateful to receive some of her wisdom. In leaving is there any advice you have for budding HBCUpreneurs? I would definitely encourage budding HBCUpreneurs to never give up. It will be challenging and you will always have to decide on a new direction or reinvention, but stay true to YOUR vision. Once you take that leap, it’s a continual learning process that you won’t understand until you actually do it. All the research in the world won’t be comparable to the actual experience. It is important to engage your supporters. IT IS OKAY TO RECEIVE HELP! That’s one of the biggest lessons I learned. We have a great network within the HBCU community, so let’s support and patronize each other’s businesses! Also, It’s OK to promote yourself. You MUST because if you’re not excited about it, who else will?